The first part of this drive is described here. It took us as far as the actual Red Rocks made of sandstone and eroded by the Shingwedzi over eons drive along the S52 is one of those highly recommended drives. It takes you to a number of viewpoints one of which is at the Red Rocks site. Red Rocks refers to a large sandstone slab eroded by the Shingwedzi River aided by cyanobacteria. I can't remember exactly where I took this photo of a Giraffe but it is a good example of how Giraffe families stick together. 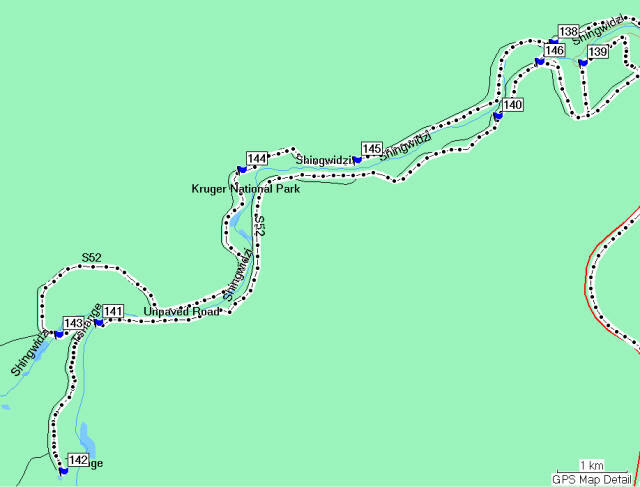 I left the Red Rocks get-out point (139) and traveled the short loop in a clockwise direction down to waypoint 140. Most of the drive takes place through woodland areas. At waypoint 140 I had to take this shot of one of the most endearing little creatures you can ever hope to see ... the Dwarf Mongoose. I was lucky this one stayed around for me to get a shot ... they normally disappear into the grass but stop just inside and it is often possible still to see them as they continue to observe you. Waypoint 141 marked the crossing of the Tshange River and shortly thereafter at the left turn I met another elephant grazing close to the road. The turn off was to drive to the Tshange viewpoint where there were two couples having a late breakfast underneath the trees. It started raining slightly as I left to meet my elephant at the 'T' junction again. The turn off to the Bateleur Private Camp is off the leg that goes to the viewpoint at waypoint 142. 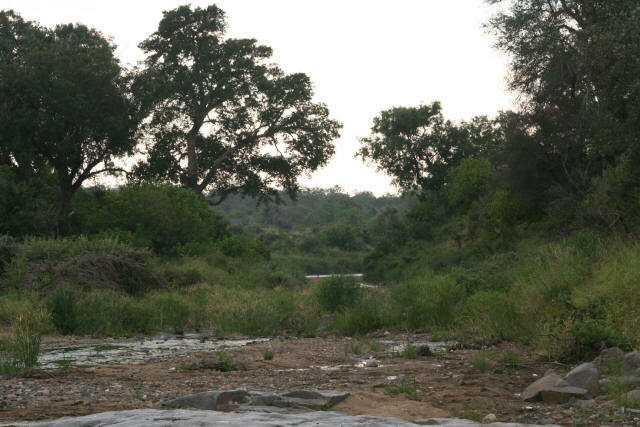 The lookout at waypoint 142 is called Tshanga Hill after the nearby tributary of the Shingwedzi called Tshanga (cattle kraal) in the Woodlands region of the Kruger ... there are 22 designated sections in the Kruger run by a resident ranger. This area is aptly named Woodlands for the many splendid trees. There is also a high concentration of elephants in the immediate area. 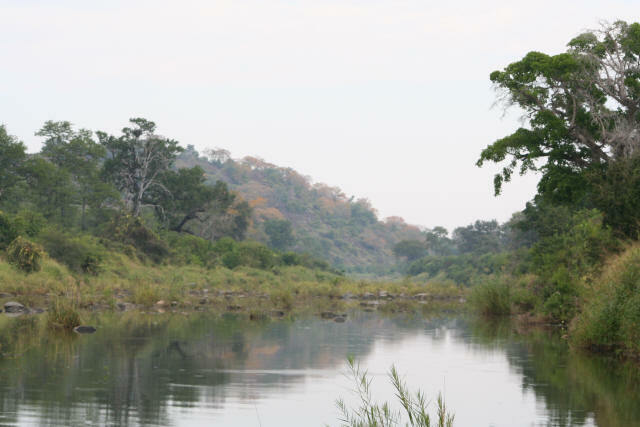 Waypoint 143 is where the S52 crosses the Shingwedzi. The flow was very gentle and the pool you see in the picture is really the remnants of the rainy season. till a few drops of rain. Take note of the splendid tree colours with autumn shades on the hills and lush green adjacent to the river. 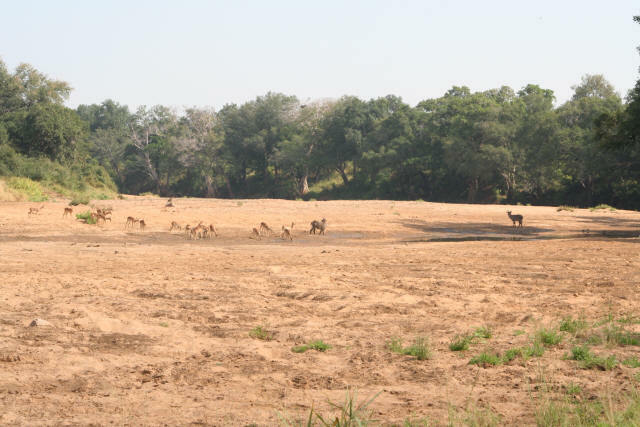 The Kruger is full of enchanting views like this. And take a look at the tree below shot a few kms down the road. 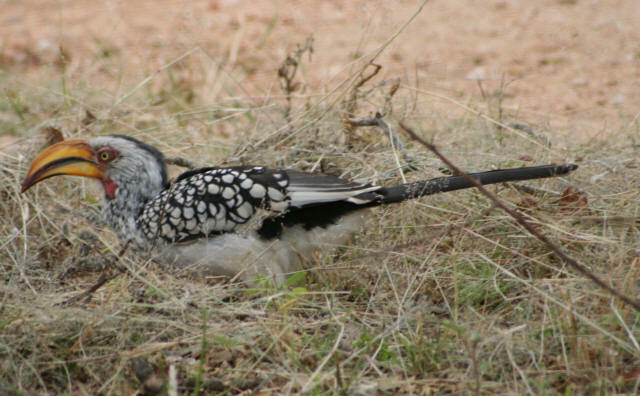 The ubiquitous Southern Yellow-billed Hornbill . The hornbill is often willing to pose for a photograph and I think this was a bit special. Waypoint 144 ... Now here's a garden to be proud of. 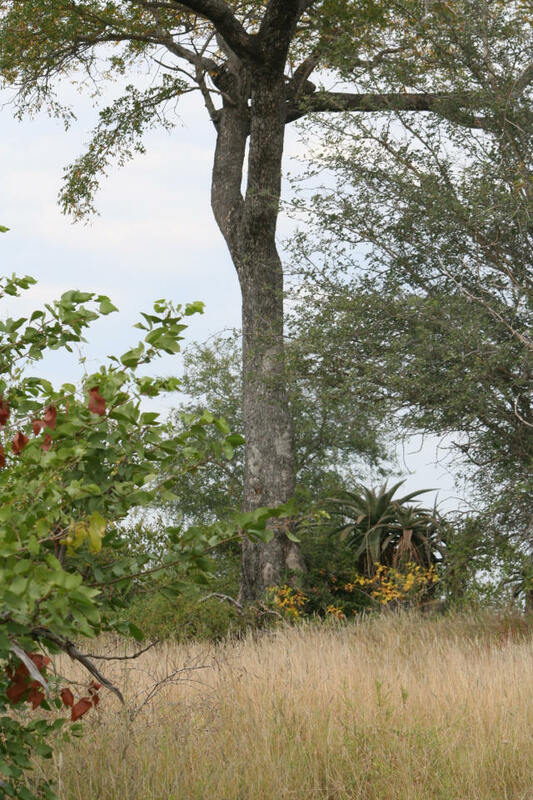 Look how the grass tree and shrubs blend in and look below to get a closer view of what's at the base of this tree. Aren't these just perfect natural colours you would dearly like to have in your garden setting? 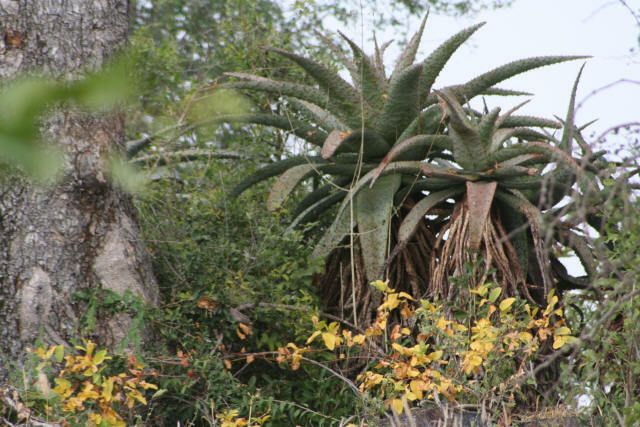 The "jungle" at the base of a tree is emphasized by the Aloe-type plant with its menacing thorns and spikes. Waypoint 145 ... My favourite photo. 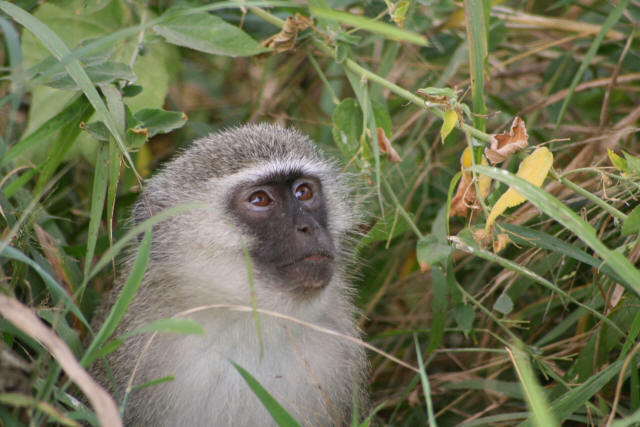 The Vervet Monkey is one of only 2 species of monkeys in South Africa and it is common in the Kruger. They live in family groups. Also close to waypoint 146 ... Chances are you have never seen a fruit like this one. Perfectly globular in shape it reminded me of a far away planet covered in craters. 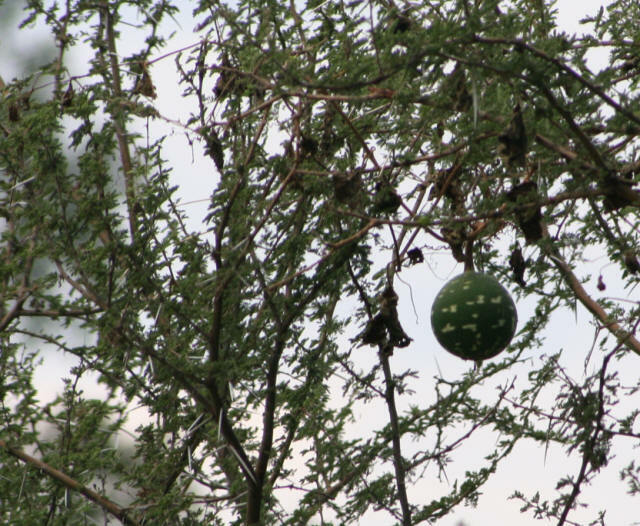 The next picture gives a closer view of the Wild Calabash... The Wild Calabash, Lagenaria sphaerica ... Family: Cucurbitaceae (pumpkin family) is described as follows by www.planzafrica.com : Perennial with a woody rootstock. Stems annual, herbaceous, robust, climbing or trailing, angular, hairless, up to 10 m long or longer, often completely leafless when fruiting. Leaves rather rigid, shaped like a hand, margins toothed, 50-180 mm long, both surfaces roughly and shortly hairy, upper surface dark green, lower surface paler; foetid when crushed. Leaf stalks 20-80 mm long, with two lateral apical yellow-green glands. Tendrils split in two. Flowers fragrant, opening in the evenings, corollas saucer-shaped, velvety white or cream-coloured with green veins, petals rounded, 22-60 mm long; male and female flowers on separate plants (dioecious). Male flowers 2-10 in racemes , anthers prominent, yellow, greatly contorted. Female flowers solitary, stalked. 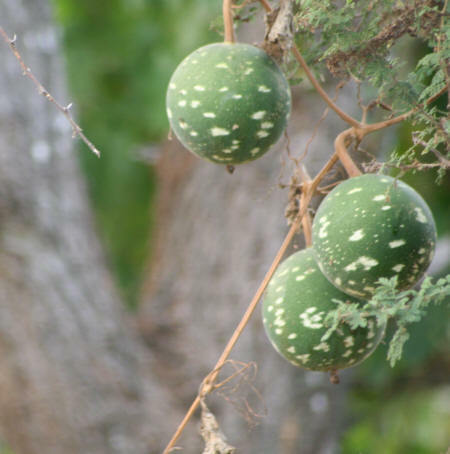 Fruit hanging from a stout 30-100 mm long stalk, subspherical, 60-100 mm across, deep green with pale green or yellowish transverse, slightly raised patches, with a hard shell and whitish flesh, foul smelling when ripe. Seeds whitish to yellowish, oblong-triangular in outline, flattened, 10-15 mm long. Waypoint 147 marked the end of a wonderful full morning's drive through forest, bush, riverscapes and not to forget Red Rocks. Passed elephants, monkeys, birds galore, strange plants and beautiful trees. Saw Giraffe, Impala and Water Buck and not to forget the Dwarf Mongoose. I now drove down the H1-6 to complete the Tropic of Capricorn loop I had been unable to do the previous day.